Hugo met the Food Bank shortly after losing the job that supported his wife and three children. 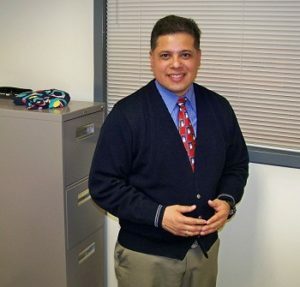 The SNAP (Food Stamps) Outreach Program at the Food Bank quickly helped Hugo apply for SNAP benefits and also connected his family with the many other resources available. “SNAP dollars were our means to survive after I lost my job. We made the food stretch as far as possible. This was a tough time for me as a man because I could no longer provide for my family,” commented Hugo. Hugo tried time and time again to find gainful employment. He was finally hired as a temp worker and while it helped, he knew that it wouldn’t last and again was faced with painful realities. “There were times when we would bring groceries home and the kids’ eyes were huge. We all felt normal, it was pure excitement. Other times, I couldn’t put gas in our only car and I didn’t have a single dollar for an ice cream cone. We had Christmas with no presents. The only thing we survived on was hope. Hope that came from the Food Bank staff that did not give up on us,” recalled Hugo. Hugo’s time on SNAP was luckily short lived, thanks to an organization taking a chance on hiring him. Today, he is helping others who are in need – connecting them to similar resources he was once pointed toward. Hugo’s wife is also working, and his family is now collecting and donating food to the Food Bank. He wants to make sure his family remembers how blessed they’ve been.